Over the past couple of years those dipping in and out of EMLO with regularity will have witnessed increasing commitment to and engagement with growing numbers of students. Not only is EMLO’s impressive team of Digital Fellows drawn primarily from Oxford’s student cohort, but we couldn’t be more delighted that the pioneering Bodleian Student Editions scheme (piloted over these last three terms) will continue in the forthcoming academic year. Now this week we focus on another student catalogue in the form of a cluster of letters from the correspondence of Elizabeth Compton, countess of Northampton (1694–1741). A group of second-year History undergraduates, who in Hilary term took the Further Subject ‘Writing in the early modern period’, checked the metadata from the (sadly not-always entirely accurate!) Bodleian card catalogue, entered a range of salient corrections, enhanced the records with additional details, and worked up a number of transcriptions. The results make for a fascinating read. 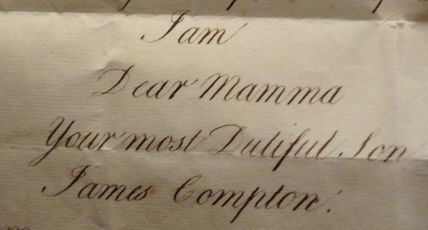 Detail from letter of 29 August 1734 from James Compton to his mother Elizabeth. (Bodleian Libraries, MS Eng. letters e. 2, fols 70–71). With Elizabeth based in Northampton (at Castle Ashby),3 in Warwickshire (at Compton Wynates),4 or in Staffordshire (Tamworth Castle), James is clearly undergoing his education away from her and is in the care of one Nicholas Guillibeau, who writes with dedicated regularity from Fulham. The letters, sent often via ‘by Ashby Bagg Northampton-shire’, are concerned primarily with the boy’s health. A typical entry reads: ‘My Lord Compton continues thank God in very good health except a little Cold His Lordship has got, but no Cough.’5 At this point, in 1734, James was eleven. 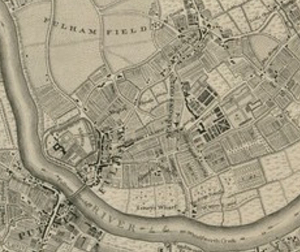 Besides updates on health and an assortment of remedies prescribed, the letters inform his mother of visits from various relatives; of concerts; of a winning lottery ticket for his sister, Jane; of the order and receipt of wine; and we witness his twelfth birthday on 6 July 1734, celebrated with a delivery of venison and its consumption! An incident involving the sister of the school’s headmaster (Mr, or Dr, Croft) is related also: ‘as she was walking out to go to their field, she was run over by a Horse upon full speed whose rider was Drunk, and she was so trempled and bruised by the Horse’s falling upon her that she was took up & brought Home for Dead. She was immediately let Blood & other proper Medicines apply’d which brought her a little to her Self. She lies still in a very weak and dangerous Condition there being yet but small hopes of her recovery.’6 A trawl through the indispensable Old Bayley Online database reveals this unfortunate sister to have been Ann Croft, described as an ‘old woman’ (actually, she was born in 1683, which makes her fifty-one at the time of the accident) who was brought down whilst walking with two children at the junction of Bear Street (now Rigault Road) and Sow-Gelders Lane (now Burlington Road) by George Turner, a servant, when his horse knocked her over and caught a hind leg in her petticoats. Ann Croft did not survive her injuries and died just eight days later. Turner was charged with murder and acquitted on a verdict of manslaughter. Despite Guillibeau’s mention of many letters written by young James, in this collection there is just one from the boy to his mother: in a gorgeous copperplate hand, he discusses his sister Jane’s preference for one pony over another. The saddest note of all in this story is that the poor sickly young James did not survive into adulthood and died just five years after these letters were exchanged, at the age of seventeen. A more positive thread finds a delicious EMLO-esque cross reference concerning the school, however: another pupil known to have attended the establishment just a few years after James Compton was none other than Thomas Pennant, the subject of research by our colleagues at the inspiring Curious Travellers project. How and why these letters to Elizabeth Compton came to be separated from the bundle that ended up in the possession of her daughter Charlotte is at present a mystery.11 As with EMLO’s previous undergraduate catalogue, that of early bluestocking Sarah Chapone, the letters were selected for their relatively straight-forward hand. In each catalogue, the students have transcribed only a selection and more work remains to be done. From the vantage point of well-earned summer vacations, however, we hope EMLO users will celebrate and explore the work of our talented young scholars. Certainly, we could not be more delighted that EMLO has emerged as a platform to showcase their ongoing work. This entry was posted in Uncategorized on July 30, 2017 by Miranda Lewis.